I promised myself that I would hold off on showing the wind chill map unless it was absolutely necessary this spring. Well, today, it was necessary. But the fix is in. A warm front will glide through tomorrow morning and bring the warmth back - to part of New England. Not expecting northern New England to take part in the 50s and 60s this time around. Stubborn high pressure is stopping the front from advancing much farther than the Northern Mass. border tomorrow. On the cold side of the front, I'm only expecting highs in the 40s. Downpours are in the cards tomorrow too. The air is just unstable enough that a few rumbles of thunder are possible as the cool front crosses around midday. Thereafter, the rain will decrease, and the clearing moves in during the evening. Not a half-bad turnaround for an otherwise wet day. Fine holiday weekend setup coming. 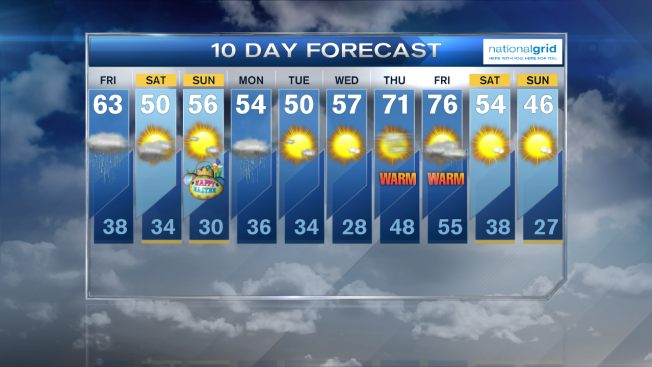 High pressure will build in behind this weather system and provide sun both days...but it won't be bright for everyone. Onshore breezes mean low clouds could swarm across Southeast Massachusetts and snuff out any Saturday sun. That breeze is gone on Sunday, but afternoon clouds will advance with our next system on Monday. All in all, a semi-seasonable, semi-bright weekend.